Londoners are being given an exclusive behind the scenes peek at Middlesex University this weekend as part of the capital’s Open House celebrations. 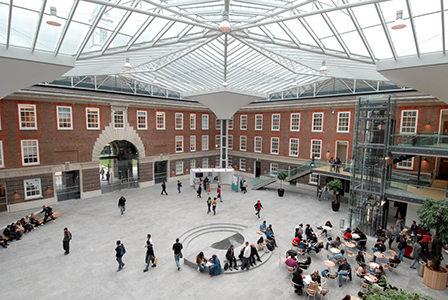 Throughout Saturday 19 September, there will be a series of free guided tours of the Hendon campus, giving locals and architecture enthusiasts a glimpse into the University's striking glass-roofed quadrangle which transformed from a through road roundabout to what it is now - the heart of the University's activity. The tours will also include a look at 'The Grove', a recently added £80 million purpose-built centre for creative courses, featuring state of the art workshops, TV and photography studios. Archivists from the University are also displaying a never-before-seen one day exhibition showcasing student-made dresses dating back from the 19th century, contemporary pop-up books, a Victorian family scrapbook and a selection of children and adult's comic books including Marvel. Tours will be led by award winning architects BPR who designed many of the University's newest buildings. Open House London is the capital's largest annual festival of architecture and design, taking place on 19 and 20 September 2015. Over 700 buildings across the capital open their doors to give Londoners the chance to explore and learn about some of the city's most eye-catching architecture. Vice-Chancellor Tim Blackman said: "Open House London is a fantastic opportunity for local residents to take a closer look at buildings right on their doorstep. Visitors will be able to see how our 160 metre squared glass roof was constructed and visit our live bee colony on The Grove's roof, producing honey which is sold locally. "For the first time, we are not only opening up our buildings to show how the campus has developed, but we are also showcasing rare and historic artefacts from our archives, which will be a must-see for those interested in how fashion and popular culture has progressed over the last century. "Visitors can also look to the future of the campus, and take a peek inside the work currently ongoing in constructing our new building, Forum North, providing additional teaching space, due to open in August 2016." Tours take place every half an hour between 11am and 3.30pm, no booking is required. The University is on The Burroughs, Hendon, NW4 4BT. Free parking is available on campus. For further information, contact Lynda Tahri at L.Tahri@mdx.ac.uk.